Business are facing change at an unprecedented rate. The evolution of technology, innovation and globalization have brought unique risks to the marketplace. Business landscape continues to change as organizations find new ways to compete in today’s global economy. This change brings with it risk. Risks are flying at business in a bewildering range of different shapes and forms: technological, a less certain political landscape, economic, climate, the list goes on. Each of those risks requires a measured and calculated response, in an appropriate timescale. Our SMART Enterprise Risk Management (ERM) methodology assists your organization to develop a risk profile, assess your current risk management processes against best practices, and design an ERM program tailored to your organizational needs. Our approach includes the identification, assessment, treatment, monitoring, management, and communication of risk. We provide a road-map to improve your risk management processes. Managing risks has never been more important than today. Regulators, ratings agencies and listing exchanges around the world expect management to identify, assess and respond to risks in a prudent fashion. Board of directors are expected to share in management’s responsibility for risk management and assessment across the enterprise. The implementation of enterprise risk Management (ERM) can facilitate better capital resource allocation decisions, increase operational efficiency, and enhance a company’s risk control efforts to support critical strategic, compliance, and governance initiatives. 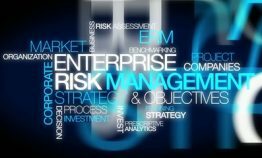 Enterprise risk management (ERM) is a structured, consistent, and continuous risk management process applied across an entire organization that allows board of directors, management, and stakeholders understand and address the key risks to the organization. Even in the earliest stages of implementation, Enterprise Risk Management (ERM) can improve an organization’s risk management – transitioning it from an isolated departmental view to a balanced, multi-team perspective. It is a means to aggregate and refine your business’ risk exposure assist many of your teams in making more informed decisions while evaluating it all from a more complete analytical view. All organizations – regardless of size, structure or industry – have a myriad of risks and challenges to contend with on a regular basis. From natural perils and market volatility to regulatory compliance and employee issues, the uncertainty and unanticipated risks are embedded in everything we do. But to better ensure operational efficiencies and stability, it is critical for an organization to identify, understand and effectively manage that risk to close the gap between creating opportunity and jeopardizing success.